An essential smoky-eye shadow collection with 14 shades, featuring neutral, cool-toned mattes and metallics. These shadows feature Anastasia Beverly Hills’ signature full-pigment, and easy-to-blend formula. The palette includes double-ended brush for effortless application. This eyeshadow palette makes an excellent gift for any beauty junkie, especially an eyeshadow junkie such as myself. I would get if for someone who collects eyeshadow palettes, yes that is a thing. This palette is one of their prettiest to come out to date. 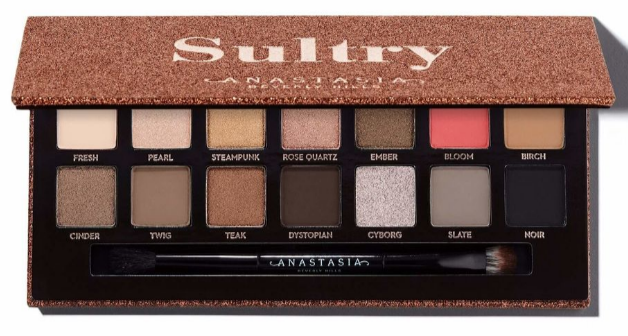 The Anastasia Beverly Hills Sultry Palette is available from www.anastasiabeverlyhills.com, www.ulta.com and www.sephora.com. Like SEPHORA on Facebook: https://www.facebook.com/Sephora?ref=br_tf; Follow SEPHORA on Twitter: @Sephora, Follow SEPHORA on Pinterest:http://www.pinterest.com/Sephora/; Follow SEPHORA on Instagram:http://instagram.com/SEPHORA#; Subscribe to SEPHORA on YouTube:http://www.youtube.com/channel/UC9YX5x_VU8gfe0Oui0TaLJg; Follow on Google+: https://plus.google.com/+ Sephora/posts; Follow SEPHORA on Wanelo:http://wanelo.com/sephora and Follow SEPHORA on Tumblr:http://theglossy.sephora.com/.